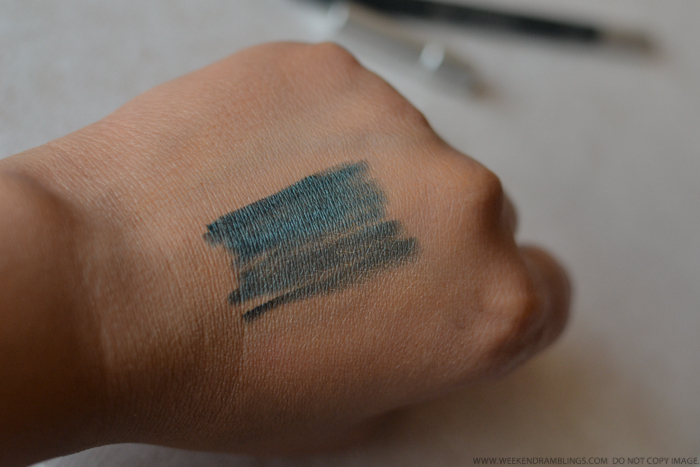 I don't know what I was thinking when I splurged on the Urban Decay vault of pencils, but it's only when I started working my way through reviewing them that I noticed just how easy it is to replace one shade for the other. I have been meaning to review Loaded for a while now and always end up applying some other random dark blue/green color, realizing the mistake only when all the good natural lighting has gone off. Who knew a green, a darkened green, and a brownish green can all look the same?! :P Yes, most people would read the name on the pencil, but oh well... Anywho, moving on to the pencil, Urban Decay's 24/7 pencil in Loaded is a darkened green with a hint of grey to it. The Sephora website describes this as a shimmery pencil, but I think this has more of a sheen to it than a proper shimmer. Scroll on for more photos. 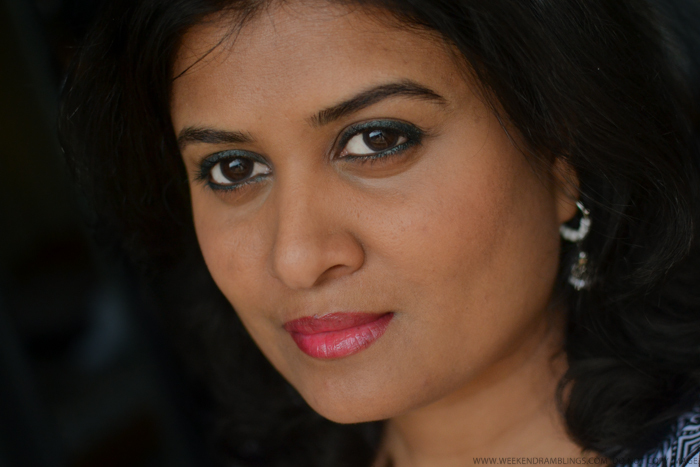 Urban Decay Eyeliner Pencil - Loaded - Swatch on my darker Indian skin tone. Like most Urban Decay 24/7 pencils I have tried so far, Loaded too glides on easily on to the lids, and once set, it stays on pretty much the whole day long. 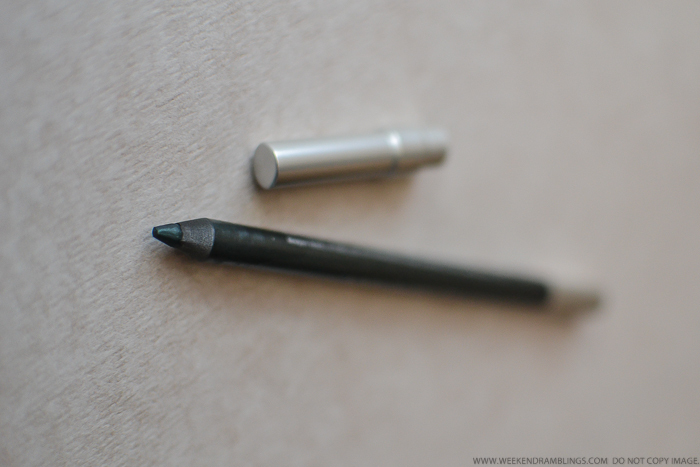 I do have very oily skin - more so in the summers - and on very hot days or when I have wandered about a lot outdoors (doesn't happen much), this pencil does tend to smudge a teensy bit, especially along the waterline. It's definitely among the more long-lasting eyeliners I have tried so far, though. Wearing Urban Decay's Eyeliner Pencil in Loaded along my upper and lower lashline and waterline. I generally prefer warmer shades, but Loaded is a darker color and doesn't clash too much with my skin tone. The photo above would probably be the only time I would use this on it's own, though. I prefer pairing Loaded with warm coppery/brown eye shadows, and because it stays on a long time, it also works as a good base for smokey eye makeup looks. 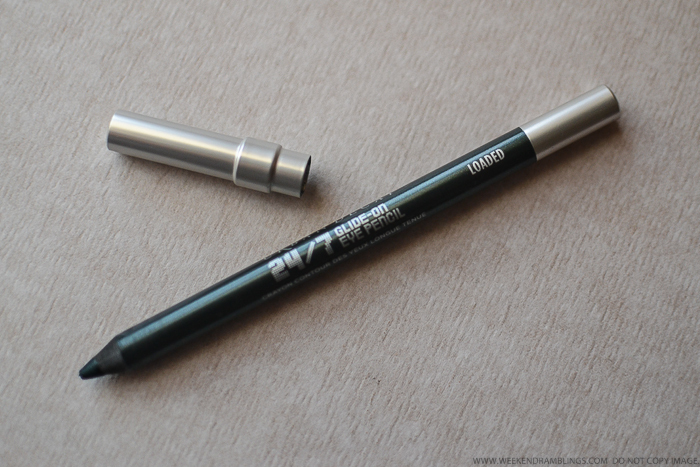 Have you tried Urban Decay's Loaded eyeliner pencil? What's your favorite way to wear this (or a similar) green eyeliner? Do share!